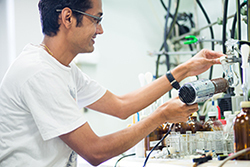 Institute for Molecular Science International Internship Program in Asia (IMS-IIPA) provides a opportunity for graduate students and young researchers of our MOU partners in Asia to stay in the IMS laboratories related to the basic research up to 6 months. Through the experience, we encourage them to continue the basic research in their own countries as well as to build up the future collaboration. Copyright @ Institute for Molecular Science All rights reserved.